To configure the advanced settings, click File >> Settings >> Advanced. Many computers are set to automatically go into a suspended mode or turn themselves off, if they are left idle for a certain amount of time. When the computer is controlling a surveillance system this is usually undesirable. 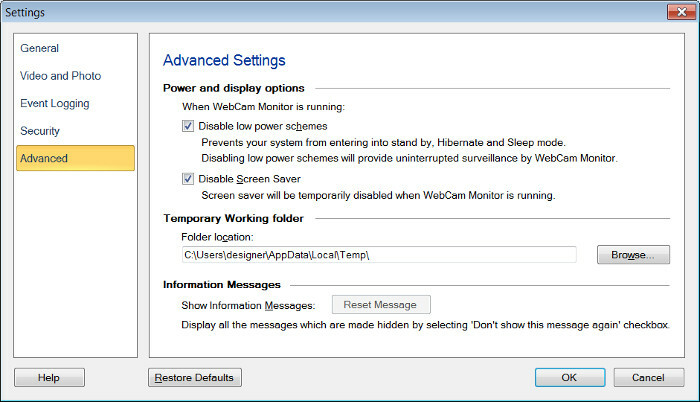 So, enable the option Disable low power schemes while WebCam Monitor is running. In addition to these low power schemes, you can choose to disable the screensaver so that you are not interrupted when you are watching the camera previews. To change the path where the temporary files will be saved, click the Browse button. If you wish to reactivate the messages, click the Reset Messages button. Note: This button will be available, if you have checked the Don't show this message again dialog earlier.